Source: Naval History & Heritage Command photo NH 43964. RAdm. William Rogers Taylor, USN. William Rogers Taylor was born in Rhode Island on 7 November 1811. He was appointed as a U.S. Navy Midshipman in 1828, served in the sloops of war Saint Louis and Peacock during the next decade, and was promoted to the rank of Lieutenant in 1840. He next had coast survey duty, then was an officer of the sloop of war Saint Marys during the Mexican War, when he also served in the Naval Battery during the siege of Vera Cruz. In 1848–49 he was assigned to the Naval Asylum in Philadelphia, then to the sloop of war Albany. 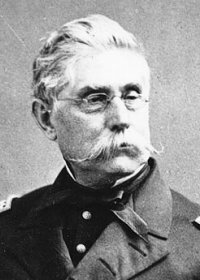 For eight years, beginning in 1853, he primarily served in the field of naval ordnance. In 1855, he received promotion to commander. Promoted to the rank of captain in July 1862, he commanded the steam sloop Housatonic during the next several months. In 1863, he was Fleet Captain of the South Atlantic Blockading Squadron. In that role, he participated in attacks on Confederate fortifications protecting Charleston, South Carolina. Captain Taylor commanded the steam sloop Juniata during 1864–65 and took part in the operations that led to the capture of Fort Fisher, North Carolina. In 1866, a year after the end of the Civil War, Taylor was advanced to the rank of Commodore. For the next five years, he had further ordnance duty and commanded the Northern squadron of the Pacific Fleet. He reached the rank of Rear Admiral in early 1871 and spent his final active duty period as President of the Board of Examiners. Rear Admiral William Rogers Taylor was placed on the Retired List in November 1873. He died at Washington, D.C., on 14 April 1889.